Enjoy and extend the time spent outdoors in a healthy, comfortable environment with the Bimini cabana. The beach cabanas are lightweight and provide infinite shading adjustment with an easy to reach adjustment knob. Brighten up the pool or beach areas with this beach product. There are many beautiful colors available to match any decor. The BIMINI folds down and is stackable for easy convenient storage. The BIMINI is easily adjusted from a seated position offering an infinite degree of varying shade throughout the day. Since an individuals needs change as does the suns angle during the day, the BIMINI can be adjusted to meet the demand simply by turning an ergonomically located Thumb Screw. The BIMINI clamps and hardware are made out of powder coated cast aluminum and stainless steel, respectively. Superior strength and durability contribute to the Biminis success within the resort industry. The BIMINI can withstand high wind loads of up to 35 MPH. Although, each location experiences different weather patterns, individual properties must assess the maximum wind conditions prior to deflating the BIMINI. The BIMINI can be stacked and stored normally along with the lounge chairs, typically 10-14 chairs per stack. The BIMINI utilizes the best fabric for commercial outdoor resort properties in the harshest environments. Sunbrella Marine or Firesist provide excellent color retention in the sun and salt areas. Since the fabric is essentially waterproof, it is easy to clean and resists mold and mildew providing years of attractive service. Logos can be applied to the Bimini to further customize the look. Dimensions: 52in. x 10in. x 34in. 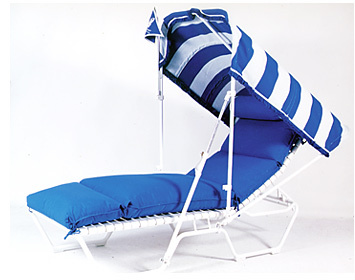 Pricing does not include chair or cushion, bimini cabana only. Personalize your Bimini with:Bimini Trim Accent, your Company Logo or Family Monogram. See below for related products. So order this model to use as your pool cabana, patio cabana or outdoor cabana today. For the beach, the pool or the backyard.